Meet Foxy, the fox with a magical tail! 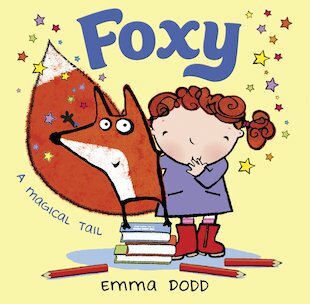 When Emily gets nervous the night before her first day at school, Foxy comes to the rescue. Emily is worried she doesn’t have all the things she needs. So Foxy offers to produce the missing items from his magic tail! But life is full of surprises when Foxy is around, and sometimes his magic doesn’t work quite as planned. What will Emily do when Foxy produces a penguin instead of a pencil? The first day at school promises to be a hoot! A bright and vibrant new story by the wonderful Emma Dodd, the award-winning talent behind numerous bestselling picture books.